It would come later in a string of retroactive “eurekas.” First, the reader mail began to come in and I began to realize that my Junior High band director wasn’t as unique as I thought. Apparently most band directors came with type triple-A personalities and egos and ambitions to match. Second, tapping into my band experience, I was reaching an audience that, let’s just say, had been underserved in the daily comics up to that point. Before long I began getting invitations to speak at various local band awards banquets. (Banquets is probably a stretch since most of them were just potluck dinners. At one point I spoke at so many potluck dinners that I came down with a mild case of Tupperware poisoning.) But, along the way, as I met more band directors, band booster parents, and band students, the process became a giant feedback loop that added to the legend of Harry and the Marching Scapegoats. At one banquet, a band director, who had been trying to arrange more practice time on the field for his band, told me how a coach had pointed to the turf and said that it was only meant for football. 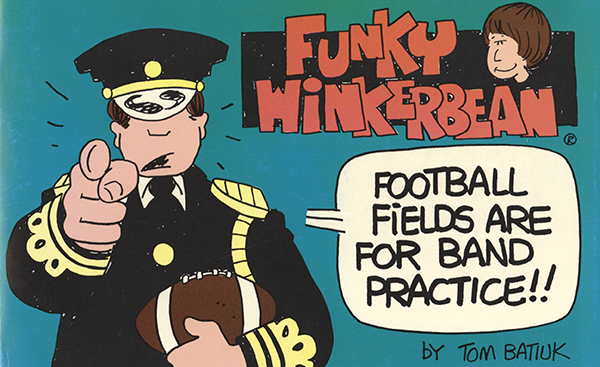 This naturally led to the September 12, 1977, strip on page 443 in which Harry makes his iconic counter-proclamation that football fields are for band practice. Soon band camp and the Fall Battle of the Bands became fixtures in the strip along with the band turkeys and band fruitcakes that began showing up as regular holiday fund-raising events. I even provided an origin story for Harry in the strip. He became a band director in the way they usually do: He was bitten by another band director late one night in the school parking lot. It seemed that no matter how outrageous I got, band directors and their bands enjoyed the gentle jibes, and I think the reason it worked so well was that when all was said and done, they recognized it as an inside job. This guy had to have been in the band.